With their unique hexagonal shape and surround-tan technology, Focus vertical booths are designed for customers who don’t take their tans lying down. With built-in speakers and volume control, Focus booths create a relaxing cocoon for the ultimate tanning experience. The high-performance design and wraparound form of the Royal Sun Express make it one of the most secure and efficient tanning models available today. 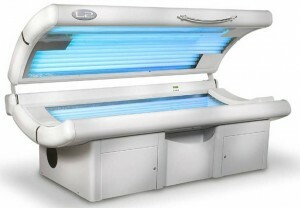 Royal Sun sunbeds make optimal use of science and art to ensure an even, beautiful tan every time. New Gorgeous Sunless: Organic, Vegan, and Cruelty-Free! Aloe Based—For soft, hydrated skin! Fades Evenly—No more scaly fading!